For outdoor kids, winter is all about having fun. Hiking, tobogganing, ice skating–the possibilities are endless. 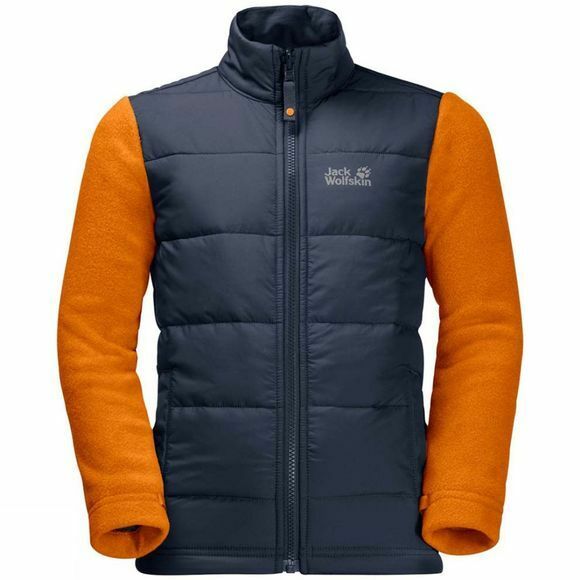 And it's even more fun when they're wearing the Kids Baksmalla Hybrid Jacket from Jack Wolfskin. The jacket is made of recycled materials. The body consists of a lightweight, wind and water resistant fabric with extra warm synthetic fibre insulation to keep your little ones warm.The sleeves are made of a warm, hard wearing fleece fabric. And Jack Wolfskin has lined them with smooth Taffeta so the jacket is easier to slip on and off.